A new Trojan called SpamSolider that infects Android devices is to blame for an increasing number of spam text messages in the US. The malicious software is bundled alongside free versions of popular mobile games like Angry Birds Space and Need for Speed: Most Wanted, according to a recent report from The Register. Once SpamSolider has infected a handset, it goes about sending out a slew of bogus text messages offering recipients a web link to a free game. Often times, a free game actually accompanies the spam but it’s just used as a distraction so users won’t get suspicious. 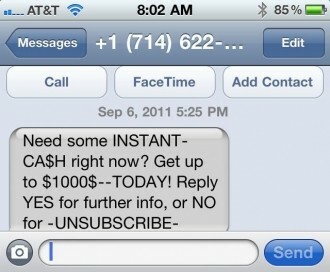 In the meantime, SpamSolider is busy sending out thousands of unsolicited SMS messages. The Trojan downloads a list of phone numbers from a command and control server, according to Andrew Conway from Cloudmark. The researcher said his company has seen a peak rate thus far of more than half a million texts per day courtesy of SpamSolider. Researchers believe the person(s) behind the Tronajn first released it into the wild back in late October. It was originally marketed as an anti-spam app before the author changed course and decided to lure unsuspecting victims in with the offer of a free game instead. It wasn’t until November 28 that the spammer began to monetize the attack with free gift card offers. As Conway points out, there are ultimately no free gift cards for the victim. Instead, spammers get to collect your personal data to use for affiliate programs to line their pockets with cash.